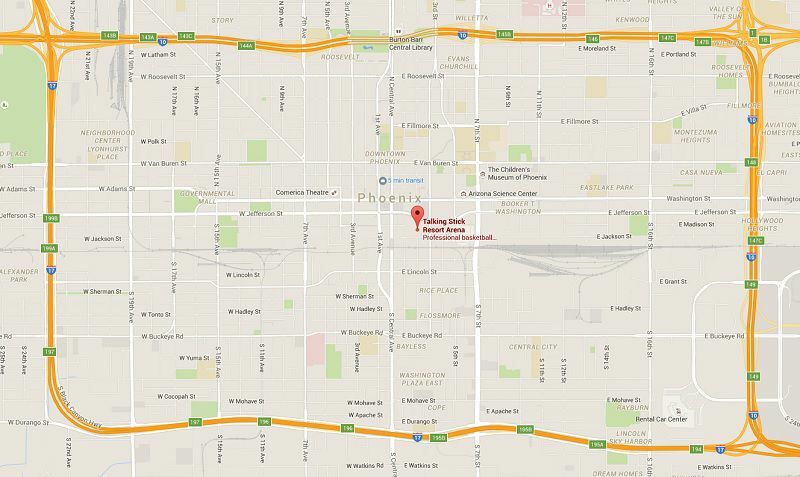 The Talking Stick Resort Arena (formerly US Airways Center and America West Arena) is in downtown Phoenix. It is the home of the Phoenix Suns basketball team, the Phoenix Mercury basketball team, the Arizona Rattlers arena football team, and many other events and concerts. The venue changed its name to Talking Stick Resort Arena in October 2015. If you need a place to stay in Downtown Phoenix, try one of these hotels. If those are not available, try a hotel anywhere on the METRO Light Rail line for cheap and easy transportation to the arena. This chart will help you to estimate how long it will take to get to downtown Phoenix from other cities and towns in Arizona. Warning: Do not confuse this location with Talking Stick Resort. The resort and casino are in Scottsdale, and there is a concert venue there. This is the large stadium in downtown Phoenix. Talking Stick Resort Arena is located on the southeast corner of Jefferson Street and First Street in Downtown Phoenix, Arizona. From North Phoenix/Scottsdale: Take the Piestewa Peak Parkway (SR 51) south to I-10. Exit I-10 at Washington/Jefferson Street. Turn right (west) on Washington Street to 3rd Street. Turn left (south) on 3rd Street to Talking Stick Resort Arena. From East Phoenix: Take Red Mountain Freeway (Loop 202) west which will merge with Interstate 10 west. Take I-10 west to 7th Street exit. Turn left (south) on 7th Street to Washington Street. Turn right (west) on Washington Street to 3rd Street. Turn left (south) on 3rd Street to Talking Stick Resort Arena. From West/Southwest Phoenix: Take I-10 east to 7th Avenue exit. Turn right (south) on 7th Avenue to Jefferson Street. Turn left (east) on Jefferson Street to 1st Street. From Northwest Phoenix/Glendale: Take I-17 south to Jefferson Street. Turn left (east) on Jefferson Street to First Street. From East Valley/Tempe: Take I-10 west to Washington/Jefferson Street. Turn left (west) on Washington Street to 3rd Street. Turn left (south) on 3rd Street to Talking Stick Resort Arena. Use the 3rd Street/Washington or 3rd Street/Jefferson station. This is a split station, so which station depends on which direction you are going. Here is a map of the Valley Metro light rail stations. Valley Metro and Talking Stick Resort Arena offer Rail Ride. When you buy a ticket to any event at Talking Stick Resort Arena, your Valley Metro Rail fare is included at no additional cost. The offer is good only on Valley Metro Rail, and only on the day if the event. You must have your event ticket or proof of ticket purchase ready to show a rail fare inspector. Other restrictions may apply.